The tea plant, Camellia sinensis, is a small shrub that is cultivated throughout the world for its valuable leaves, which – depending on the process they are submitted to – are transformed into white, green, black, oolong, and pu-erh teas. Due to their caffeine content, the leaves of the tea plant are commonly used as a stimulant and have been at the center of many cultural practices for centuries. The tea plant can grow to be very tall, but it is typically pruned and trained to grow as a small tree or shrub in order to make harvesting easy. Tea plants can be grown at home, but will take time and patience. While the tea plant (Camellia sinensis) is a tropical species, native to the southern regions of Asia, and it grows best in warm, humid climates, different varieties have been adapted to cooler, temperate areas, and now tea plant is commercially cultivated in different countries, such as India, Indonesia, Japan, United Kingdom, Russia, and Vietnam. 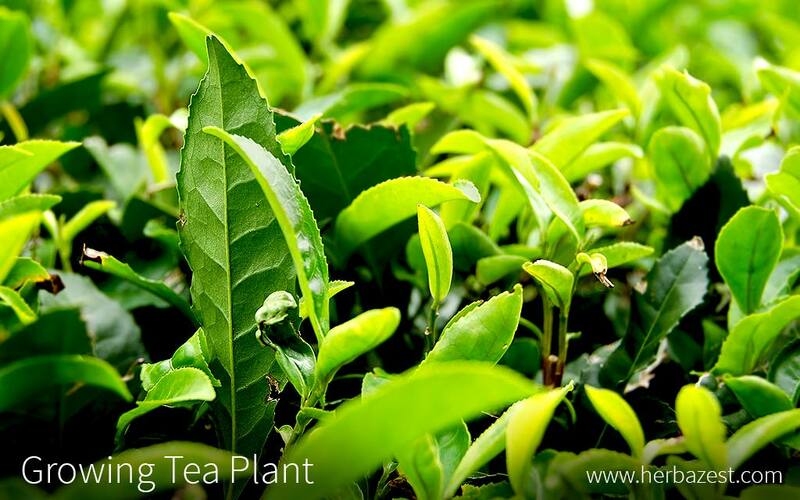 Tea plants perform best in well-drained soil that has an acidic to neutral pH. Always perform a soil test before planting in order to understand its nutrient content and how to amend it for optimal growth. Oftentimes, mixing compost and topsoil can help improve soils with a high pH. While tea plants can easily be grown from seed, they will likely vary in quality. For that reason, planting tea seeds is not recommended for commercial processing, though it may be suitable for a homegrown, backyard plant. Use freshly-harvested seeds and soak them in water for 24 hours. Separate the floating seeds from the seeds that sink and use only the sinking seeds, as they are more likely to grow into a healthy plant. Spread the seeds in the sun and keep them moist by spraying them with water. After a day or two, plant only the seeds that have started to crack in garden pots under approximately one inch (3 cm) of potting soil. Keep the pots in a shaded area and water frequently. As the seeds germinate and sprout, gradually move them to sunnier areas to prepare them for transplanting. When the plants are approximately 12 inches (31 cm) tall, they can be transplanted to their permanent locations. Alternatively, growers may choose to plant cuttings from mother plants. Choose recently-matured shoots. It is recommended to dip the cut end into a commercial rooting powder before planting it into a rooting medium, such as potting soil. Water well and keep the cutting shaded until it has a well-established root system and can be transplanted to a permanent location. Water your tea plant frequently during dry spells, especially when the plant is young and not yet established. Decrease irrigation during the cold seasons. It is recommended to apply small amounts of fertilizer regularly to promote healthy growth. The fertilizer should contain a complete mix of nitrogen, phosphate, potash, and magnesium. A slow-release fertilizer is recommended. Keep in mind that as the tea plant becomes established, its roots may spread far out from the tree. For that reason, excessive fertilizing may result in decreased growth and leaf production. When the tea plant is young, it is especially important to eliminate any weed competition that may interfere with its growth. It is recommended to mulch thickly with woodchips around the base of the plant. Keep mulch approximately eight inches (20 cm) from the trunk. When plants are young and do not have a well-established root system, pruning should be minimal and limited to shaping and training. Tea trees can grow up to 55 feet (17 m) tall, but in commercial settings are usually kept small by pruning every year. Once the tree has reached 5 - 6 feet (1.5 - 1.8 m), it should be cut back in order to maintain a manageable level and rejuvenate the growth. Usually, the topmost growth is repeatedly trimmed back in order to form a flat-topped bush. There are many insect pests that will attack tea plants, often resulting in an average crop loss of 5 - 15%. Some of the major pests include leafhoppers, mites, aphids, thrips, and caterpillars. Early detection is critical to manage and prevent infestation, since these insects cause direct crop loss by chewing on the leaves and feeding on plant sap, ultimately damaging the young leaves and buds. Appropriate insecticides may be applied to control many insect pests. Scales are a very common insect pest that targets tea plants. They feed on the plant tissue and extract the sap. Scales do not have the appearance of typical insects, as they are small, immobile, and have no visible legs. It is unfortunate that their populations can often reach damaging levels before they are noticed. Their activity weakens the plant and causes yellowing of the leaves, fewer blossoms, leaf drop, and in extreme cases, the death of the plant. If the infestation is minor, scales can be scraped off the plant and discarded. It is also effective to remove and destroy infested leaves. To prevent infestation, apply a horticultural oil in the spring. There are many diseases that affect tea plants. One of the most common and globally-endemic diseases is blight, caused by either Colletotrichum spp. or Pestalotiopsis spp. fungi. Blight diseases typically start as small, oval lesions on the leaves that grow. As the lesions grow and the leaves dry, the leaf tissue dries and ultimately drops. Different tea cultivars demonstrate varying degrees of resistance to these fungal diseases. While blight is often considered a minor leaf disease, it can be controlled with proper fungicides and tea cultivation practices. Another harmful plant illness is canker disease, which develops rapidly and can cause loss of up to half of the crop. Symptoms of canker diseases include wilting and loss of leaf luster. Eventually, the infected leaves will turn yellow and dry. Canker diseases is very difficult to control. For that reason, the best method of control is prevention. Avoid unnecessary wounds by not pruning when the plant is wet, and choose varieties of tea that are known for their resistance to diseases. Tea leaves are carefully harvested by hand, selecting only the terminal two to three leaves and the terminal bud. The processing and storage of tea leaves depend on the type of tea that is to be made. After being harvested, the fresh tea leaves are evenly spread over drying racks, in a covered, fresh area. Fans are often used in order to reduce the moisture content. Once the leaves are dry, they can be stored in a cool, dry environment in an airtight container.